late 18th c. – early 19th c.
Marble, late 18th c. – early 19th c.
Made at the turn of 1800, the present marble head is a very innovative, clever, and pre-symbolist re-interpretation of a famous Roman head of the 2nd c AD., later named the Erinni Ludovisi. The latter was discovered in the 16th century and held at the time in the Cardinal Ludovisi collection and now in the Palazzo Altemps, Rome. It is actually supposed to be a copy after a Greek original, dated of the 2nd c. BC. The Roman head was then set in a horizontal position with a green marble back and exhibited as if the head laid on a bed, like the antique Sleeping Hermaphroditos, also a Roman 2nd century AD, and also after a Greek original in 150 BC. The two sleeping heads are actually very close, and the closed eyes of the latter certainly inspired Michelangelo for his Dying Slave by (1513). These last two sculptures are in the Louvre Museum collections. 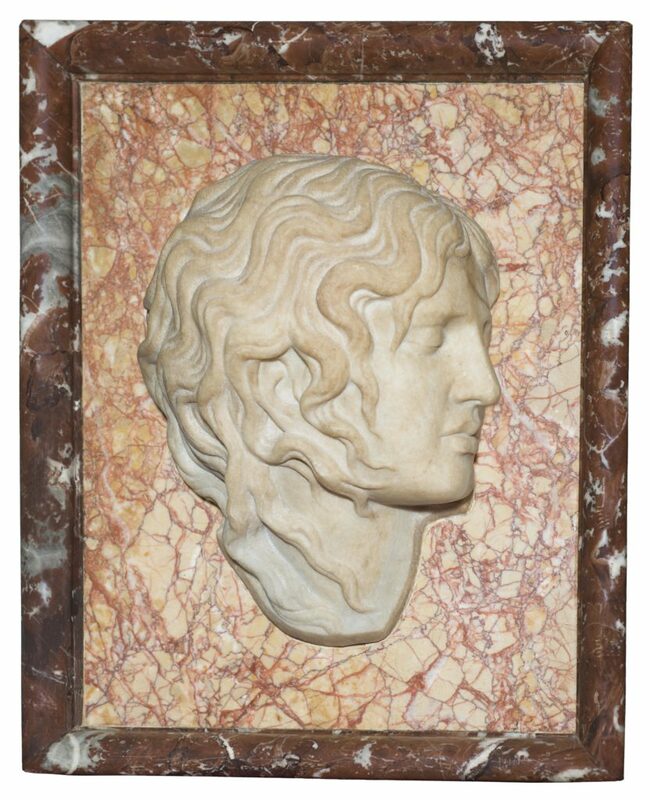 It is worth mentioning that copies of the Ludovisi head, made in the 18th and 19th centuries, are rather scarce, even at a time when Greek and Roman Antiquity fascinated artists, from early neo-classicist sculptors as Antonio Canova or James Pradier to Auguste Rodin who himself owned a collection of archeologic fragments. The present sculptor put the quiet and peaceful head here not laid on a dark, horizontal marble surface (as is the Errini Ludovici) but attached it to a red marble plaque, intended to be hung on a wall. He framed it within a porphyria and a neo-classic rounded edges style, which introduces an element of illusion., It confuses the viewer who cannot assert at first glance whether it is a painting or a sculpture. The vertical position also gives another status to the head, not only a sleeping woman, but like a trophy, a classical portrait, and it echoes to 19th century representations of free heads in the arts. During the 19th century, the original head was identified as an Erinye’s head, based on the sleeping Erinye painted on the Eumenides krater, an Apulian red-figure bell-krater (380–370 BC) that entered the Louvre Museum in 1861. The Erinyes (or Furies in Latin) are Greek mythological characters who are female vengeful spirits, featuring in tragedies as in The Eumenides, the final part of the Oresteia (458 BC) written by the Greek poet Aeschylus. It tells the story of Orestes who murdered his mother Clytemnestra to avenge the murder of his father by the latter. For that matricide, he is pursued by the Erinyes, until he reached Delphi where he found some relief in the Apollo temple. The power of the god made the Erinyes to sleep. It is thus this moment of calming down that this work is meant to represent, an Erinye asleep. However, this is only a temporary relief as once awakened the Erinyes will resume their vengeful harassment of Orestes ruthlessly. Thus, behind the apparent Sleeping Beauty, lays a harsh fury. This ambivalence adds to the fascination of this piece of art.